Have you ever tried measuring the effectiveness of your internal communication strategy? It may seem like compiling and analyzing statistics is the best way to go, but stats only prove so much. Sometimes they tell a different story from what is actually happening on your intranet. You can't measure internal communications in page views. And thinking that you can will only get in the way of finding true communicative success. So, if you don't have statistics, how do you start measuring effectiveness? For internal communications, the answers can vary ... because there are a variety of subjective methods that can work. There are things that happen on your social intranet that you can't sum up with numbers. And these things tend to be much more important than any type of statistical comparison. 1. Look at employee profiles. Employee profiles give you a glimpse into the lives of every community member. Profiles showcase their skills, abilities, hobbies, interests, and more. If you have an effective internal communication strategy, employees will fill out their profiles. They will also add a profile photo. This benefits every member of your digital workplace and enhances engagement and communication between colleagues. 2. Judge quality of content. Content is a major part of your social intranet (and of your business in general). So you'll need to create relative, timely content for both internal and external purposes. You want high quality content ... and this can only occur if you have an effective internal communication strategy. Keep a close eye on content that gets published to your intranet. If you notice a shift in quality, adjust how you communicate with your content creators. It's true that every organization is unique to itself and there's no "one size fits all" solution. That said, it's never a bad idea to have a few benchmarks to use as reference points. This will help you get a better view of how things are faring within your company intranet. There are many intranet case studies and other information about well-known company intranets available online. Reviewing these materials can get your own social intranet closer to where you'd like it to be. 4. Watch employee engagement levels. Employee engagement can make or break a company. Anyone in a managerial role knows the difficulties of keeping engagement levels from falling. A social intranet is an excellent platform to watch levels of employee engagement ... and improve them. An effective internal communication strategy can only thrive with engaged employees using your company intranet. If you see usage falling for specific individuals, it may be time to have a chat and figure out what's going on. Surveys may seem like a blast from the past, but they can be effective. To yield useful results, you must take your time to prepare a worth-while survey. If they're too long or ask the wrong questions, you'll only aggravate your employees. Keep questions short and to the point. Don't forget to highlight the topic of your internal communication strategy. 6. Look for strong collaboration. Collaboration between team members is a key sign that communication is thriving. If employees are using collaboration tools, they must be communicating, right? Collaboration is one of the main goals when companies first deploy a social intranet. And the differences can be astounding once things get off the ground. To keep everyone engaged, you may want to set collaboration goals each month. 7. Keep the intranet clean. If you have a lot of unorganized content packed into your intranet, you won't be able to find anything. A lack of intranet organization is a clear sign of communication issues. Pay attention to where things are falling apart, and how you can better organize your content. 8. Check how often employees use email, and replace it with intranet chat. Email can be a powerful tool for colleagues to communicate with each other ... but there are better methods. Intranet chat, messaging, and commenting ... they all deal with instant communication between employees. A social intranet can actually replace email for day-to-day conversation between co-workers. Analyze how your staff is currently using email. If you see a drop in messages ... well ... this may actually be a sign that your internal communication strategy is effective. If conversation on your intranet is up and email conversation is down, you're in a good spot. Intranet calendars are perfect for keeping track of events, meetings, and other happenings. And they only work if you actually use them. This is where a lot of organizations tend to fall short in the beginning. Employees can share calendars with co-workers so everyone is on the same page. Calendars are easy to use, but you still need to communicate their importance to your team. 10. Forget "time spent" on the intranet. An effective internal communication strategy doesn't rely on people being online at all times. Monitoring time spent on the intranet doesn't serve as a good benchmark for performance. The whole point of an intranet is to streamline business processes and make life easier. This means there will be many times when people will log-in, get what they need, and leave. 11. Focus on your company's success. A great way to tell if you have an effective internal communication strategy is to look at the success of the company. If things are soaring to new heights, you'll know that communication is where it needs to be. If business slows down and productivity falls, start thinking about re-evaluating things. A lack of productivity can often equate to a lack of effective internal communication. 12. Watch for project management issues. One great feature found in many social intranet platforms is the project and task management feature. This helps streamline various tasks as well as the communication involved. And as with anything else, issues can arise when people aren't using it. If you start seeing stagnant projects, look deeper into your internal communication strategy. 13. Take a "before and after" approach. When a new campaign is underway, you can expect to learn more about the functionality of your company. Campaigns bring employees together; which has a positive effect on your internal communication strategy. For example, when rolling out a new product, check your internal communication. Then immediately after the success of a launch, check it again. This "before and after" approach can be useful in all aspects of life and business. And the sooner you use it, the more likely it is you'll see a measurable change. 14. Maintain discussion in forums. For a long time, forums have been the facilitators for online conversations. The same concept applies to your company intranet. You may need to jumpstart conversations and keep them active to keep communication flowing. Employees can receive notifications to alert them of your intranet discussion forum posts. This ensures that effective internal communication moves forward. Keeping things on topic is important, but let people discuss hobbies and interests too. This can be a great way for individuals to get to know each other better. 15. Encourage ideas and creativity. When measuring your internal communication strategy, check out the ideas coming from your staff. You'll need to determine if they're quality ideas ... and more often than not, creativity and artistic development matters far more than numbers. You could have an infinite number of ideas, but they'll be useless if they add nothing to the company. This is one area of business where you can allow numbers to take a backseat. Instead, focus on the development of great ideas and solutions. 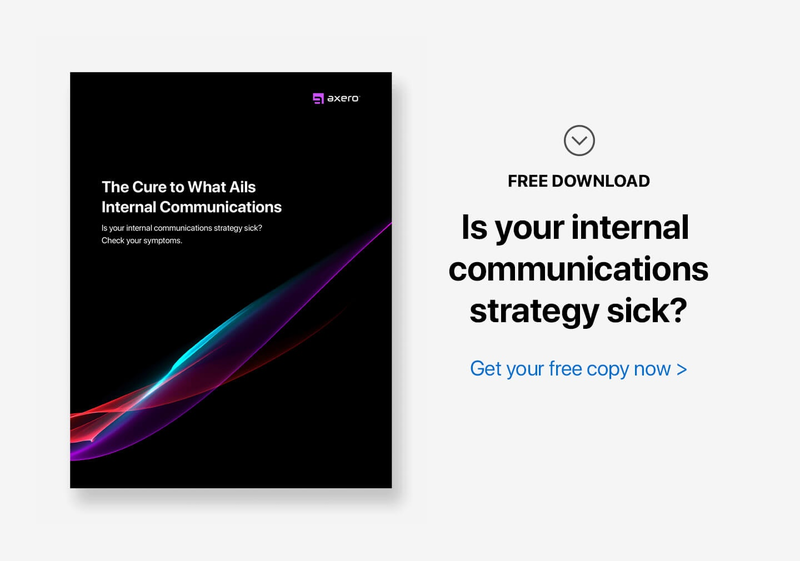 An effective internal communication strategy is important to the future of your organization. So focusing on improvement is well worth your time. Set goals, understand what you're working with, and watch communication help your company soar.